The new 747-8 is the latest derivative of the 747 family of airplanes and is being developed in both freighter (747-8F) and passenger (747-8I, for “Intercontinental”) versions. The 747-8 offers a number of operational improvements while preserving key commonalities with the 747-400. Because the 747-8 has longer maintenance intervals than the 747-400, the airplane spends less time on the ground. The 747-8F is scheduled to enter service first, followed by the 747-8I in 2011. This article provides an overview of the key differences between the 747-8 and the 747-400. The 747-8 is externally similar to the 747-400, but it has a higher gross weight, a longer fuselage, a new higher-aspect-ratio wing, and new higher-bypass-ratio engines (see fig. 1). The 747-8 also incorporates advanced alloys, updated systems, and improved aerodynamic efficiency for better cruise, takeoff, and landing performance. The primary external differences between the 747-8 and the 747-400 are in wingspan and fuselage length. They are virtually the same height. Boeing designed the newest 747-8 model to have as much commonality as possible with the 747-400 while also incorporating advanced technology from the 787. For example, the 747-8 and 747-400 have the same type rating and ground-support equipment. Flight handling characteristics of the 747-8 are also very similar to the 747-400. Engines optimized for the 747-8. The 747-8 is powered by General Electric high-bypass-ratio engines, such as those used on the 787 Dreamliner. The engines share a common core with the 787 and feature composite fan blades and a composite fan case; a low-emissions combustor; and a virtually maintenance-free fan module (see fig. 2). The 747-8 is powered by GEnx-2B engines. 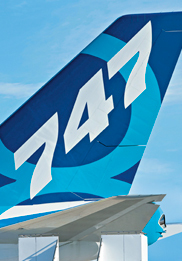 The engines share core commonality with engines used on the 787 but are optimized for the 747-8. The redesigned wing on the 747-8 offers a number of benefits, including improved overall performance, reduced noise, and greater fuel capacity. Improved flight deck. 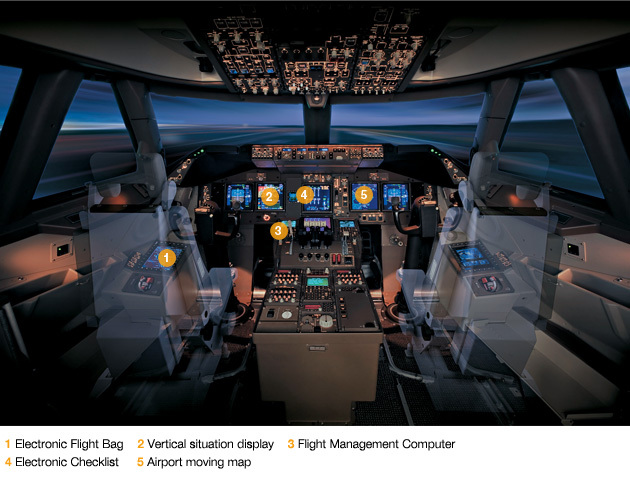 The redesigned flight deck on the 747-8 incorporates technology from the 787 flight deck while preserving operational commonality with the 747-400 (see fig. 4). The 747-8 flight deck incorporates new features such as multifunction displays, electronic flight bag provisions, electronic checklist, and tabber control device for the flight management computer. Electronic flight bag (EFB). 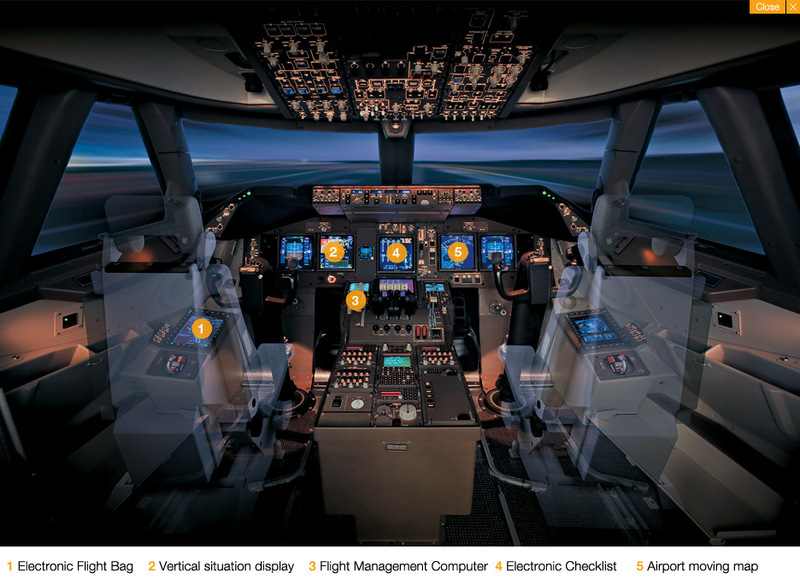 The Boeing Class 3 EFB (optional on the 747-8) brings digital information management to the flight deck; substantially reduces the need for paper; and improves communication among flight crews, dispatchers, and air traffic management. Vertical situation display (VSD). The VSD gives pilots a clear view of the airplane’s current and projected flight path. An early warning alerts the crew if the airplane’s trajectory is in conflict with the terrain or deviating from the desired approach path. Graphical presentation of the vertical situation facilitates early detection of path errors, including missed glide slope intercepts. Flight management computer (FMC). The new FMC can store all data currently available from the worldwide navigation database and is designed to accommodate the anticipated increase in data in the next 20 years. Electronic checklist. Comprehensive electronic checklists enhance safety, save time, and reduce the amount of paper that pilots and flight crews must carry on board. Electronic checklists are easy to update, revise, and distribute. Airlines can customize the checklists to conform to their own procedures. Airport moving map (AMM). The AMM combines high-fidelity airport taxi charts and an electronic map of airport taxiways, runways, and gates, providing precise navigational signals that show flight crews the airplane’s position on the ground. The flight deck includes a new flight management computer, integrated approach navigation, global-positioning-landing-system autoland, navigation performance scales, and vertical situation display. Liquid-crystal-display screen technology replaces cathode-ray-tube screens throughout the flight deck. The 747-8 has the same type rating as the 747-400, enabling operators to increase schedule flexibility and pilot productivity by employing a single-pilot pool flying multiple airplane types. New environmental control system (ECS). The 747-8 uses an advanced ECS similar to the system used on the 767-400 Extended Range. This system features digital control, lighter weight, increased reliability, and reduced maintenance. More cargo volume. With a fuselage that’s 18.4 feet (5.6 meters) longer than the 747-400F, the 747-8F has 16 percent more revenue cargo volume. It retains the 747-400’s nose-door loading capability, industry-standard 10-foot-high (3 meter) pallets, and cargo-density capability of 10.3 pounds per cubic foot (165 kilograms per cubic meter). The 747-8F has a maximum structural payload capacity of 148 tons (134 tonnes) and, with 4,245 cubic feet (120 cubic meters) greater volume than the 747-400F, the airplane can accommodate four additional main-deck pallets and three additional lower-hold pallets (see fig. 5). While the 747-8F can carry more cargo than the 747-400F, it also has an improved cargo handling system that is lighter, more reliable, and provides more flexibility, making it more efficient to load and unload the airplane. The 747-8F has nearly equivalent trip costs and 16 percent lower ton-mile costs than the 747-400F. The new 747-8F airplane offers a range of 4,390 nautical miles (8,130 kilometers) at maximum structural payload. Passenger version. The 747-8I offers 51 additional seats and 26 percent more cargo volume than the 747-400, offering carriers greater revenue-generating opportunities (see fig. 6). In addition, the 747-8I’s new interior includes a curved, upswept architecture designed to give passengers a greater feeling of space and comfort while adding more room for personal belongings. The interior architecture is accentuated by new lighting technology that creates a perception of airy brightness and provides smooth lighting transitions to offer a more restful environment. The 747-8I also offers private cabins and state-of-the-art in-flight entertainment options (see fig. 7). The 747-8I includes a new door 2 entry (left) and architecturally designed interior, with lighting similar to that of the 787 (right). The 747-8’s new wing design and engines, and the resulting improved cruise performance, make the airplane environmentally friendly. The 747-8 reduces carbon emissions by 16 percent compared to the 747-400 and is 16 percent more fuel efficient. It also has a 30 percent smaller noise footprint and operates at 52 percent below the International Civil Aviation Organization (ICAO)’s Committee on Aviation Environmental Protection (CAEP)/6 limits for nitrous oxide (see fig. 8). The 747-8’s noise reduction makes it more versatile for operators because it can operate longer at noise-sensitive airports than the 747-400. The 747-8 meets or exceeds the latest emissions standards for hydrocarbons, carbon monoxide, smoke, and nitrogen oxides. Because the maintenance program for the 747-8 has longer maintenance intervals than the 747-400, fewer consumables are used, less waste is produced, and the airplane spends less time on the ground (see fig. 9). The use of advanced alloys, which are also on the 777, greatly reduce corrosion. Light-emitting diode lighting is used wherever feasible, reducing bulb replacements. Improved reliability of the engines means that fewer post-maintenance engine runs are required, reducing fuel burn and accelerating maintenance activities. The 747-8 has longer heavy maintenance intervals than the 747-400. Because the 747-8 has the same door sill heights as the 747-400, it can use the same ramp equipment (see fig. 10). Pneumatic start carts, ground power units, and potable water and lavatory service carts are common between the two models. Additionally, the 747-8F can use the same cargo handling equipment as the 747‑400F. The 747-8I (left) and 747-8F (right) can use the same ramp and cargo handling equipment as the 747-400, with the exception of certain towbarless tow vehicles. * Potable water, air conditioning, or ground power may be supplied from the passenger boarding bridge if so equipped. Tow tractors used for the 747-400 can typically be used to move the 747-8 as well. However, the new airplane’s higher takeoff weight requires a larger towbar, and its larger nose-landing-gear tire precludes the use of certain towbarless tow vehicles. The towbar attach fittings remain unchanged. The 747-8 is also fully e-Enabled, allowing it to use ground wireless systems to help airlines operate more efficiently. E-Enabling allows airlines to transfer data from the airplane for preventive and predictive maintenance and trending; stage loadable software airplane parts at the gate; and take advantage of maintenance and reliability information, including line-replaceable unit errors and maintenance messages. Wireless capability is basic to the airplane but not required to load data — the 747-8 is fully operational without the use of ground wireless systems. The 747-8 offers carriers increased capacity while preserving key commonalities with the 747-400. For more information about the 747-8, please contact Roy Eggink or Paul Bateman. Boeing Home | Commercial Airplanes | Contact AERO | AERO Copyright © 2010 The Boeing Company. All rights reserved.